The building was formerly the local tourist information centre. Steel frame with brick walls and asbestos sheeting roof. It is situated off the main street and on the bank of the Richmond River. The town library, swimming pool and new tourist facility are adjacent. Just under 18,000 visitors for 1998, mostly from outside the area. The La Balsas raft is the main feature. The collection includes models of naval ships, sailing vessels, merchant shipping and many associated photographs, paintings, uniforms and other militaria. 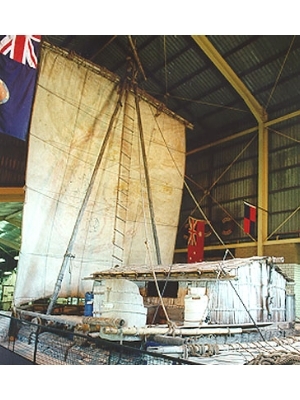 The raft is in a purpose built section of the museum and is resting on a bed of sand. A display of photographs and other material associated with the voyage is alongside. A 60 minute video of the voyage is available for public viewing.